Jerri here to share another new Christmas stamp called Winter Wonderland. I am a little unhappy with the quality of this picture because the card came out really cute in person. I did this card in different layers. 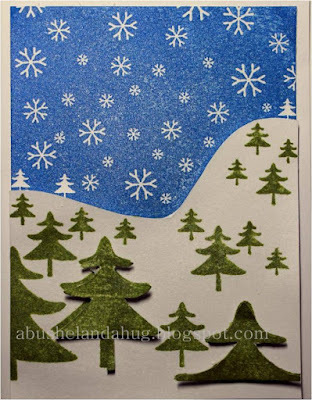 By stamping this several times, once in blue and twice in green, I was able to cut the pieces and layer them to create this card. Stamp the entire stamp in in blue and set aside. Stamp the entire stamp in green on two separate pieces of cardstock. These pieces will be cut and then layered on top of the blue. On the first green card, cut along the snow line and glue it on top of the blue. This will give you a blue sky and green trees. You can use pop dots if you choose so that this piece sits a little higher. On the second green paper, cut out a few of the trees and then put them on top of the trees already on your card with pop dots to give them dimension. You could add some sparkle to the snow or to the trees. I left mine plain but I think the sparkle would be pretty too. Don't forget to check out SALE going on until September 8th. All new release stamps are currently 15% off.